Aside from the fact that our original seat was turquoise (and we hate turquoise) and the new upholstery would be red, we knew that 50 years of use had taken its toll on the structure itself. It had to be taken down to the bare frame and rebuilt. Starting with the seat bottom (no particular reason) we commenced disassembly. It's looking pretty worn out. 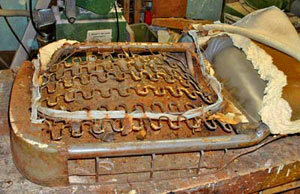 First, we turned the seat over and started removing all the hog clips and staples that held the old cover attached. Pliers, wire cutters and the occasional use of the grinder accomplished this task. The old cover is starting to come off. Note the rusty end with a threaded piece coming through? That's the rake adjustment, and we had to eventually torch the thing out and restore the threads. Once the cover was off we could inspect the frame and springs for any breaks or fatigue. 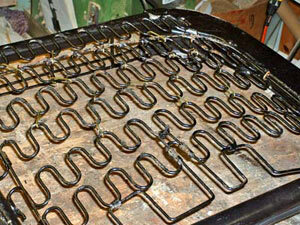 The springs themselves were in good condition and the frame was coated with a thin film of rust. We cleaned everything up and took notes on how the individual upholstery pieces were attached, along with the order of assembly. 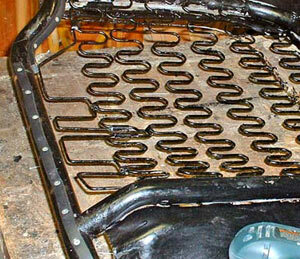 The cover is mostly off, revealing the springs and attaching strip for the bolstering. 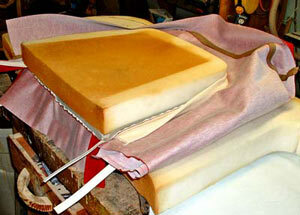 Upside down, the frame is ready to be lifted off the cover and padding. 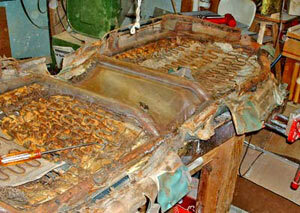 So how did we remove the surface rust, you might ask? 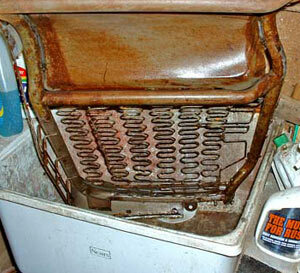 Well, we simply filled our workshop sink tub with hot water and rust dissolver and washed it away. Once the frame was rinsed and dried we primed and painted it with Rustoleum black paint. We preferred brushing it on because it provided a thicker coating. 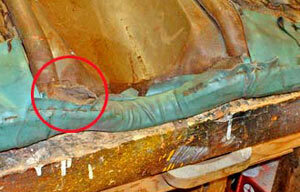 All it took to remove the rust was the right chemical and the use of rubber gloves and eye protection. We had pulled off all the cracked, disintegrated tack strip from the frame so, we dropped by the local seatcover/convertible top shop and bought some tack strip. This stuff is generic and available in several thicknesses and widths, so we simply matched the original size. The original strip had been power-riveted in place at the factory, but we don't own such machinery. Instead, we drilled through the strip and into the frame every couple inches and hand-riveted the pieces in place. Aluminum rivets will eventually corrode, but we figure they'll last 25 years or more. Another view of the tack strip, this time on the lower lip of the seat. It's ready for reupholstering now. 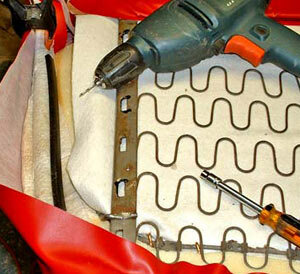 We bought new seat foam with our upholstery kit because it is quite inexpensive. 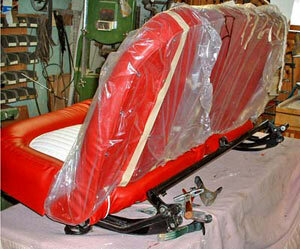 In fact, we bought pre-made seat covers and door panels for the same reason. The odd thing about Thunderbirds is that upholstery items are very reasonable - because many of them are being cosmetically restored at any given time. The entire interior kit cost less than what we would have paid for bulk materials, so we decided to forego our usual sew-it-yourself practice in the interests of time and money. 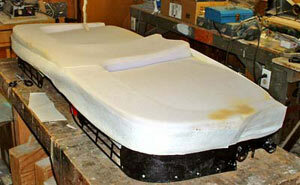 Anyway, we laid out our seat foam and test-fitted it to the frame. After assuring ourselves that it was in place we spray-glued it to the frame to hold it exactly where we wanted. Once all this was in place we stretched the seat cover over the foam and located the white seat-panels in the recessed areas. The red portion of the seat is bolstered and the white portion is the relatively flat, sunken area in the finished seat. The foam is in place. Note the cloth flap running around its perimeter. This is stretched over the frame. The first thing to do when laying on the seat cover is to position it, look on all sides (and underneath, at the back or underside of the seat) and satisfy yourself that it is placed correctly. Move it around until you are certain that it will fit the way you want. It's in the rough position, ready for the first stretching. The next step is to get the low portions (the white seating panels, in this case) into the right position and pulled down tightly. This ascertains that the bolstering will proceed with the fewest difficulties and also that the panel won't have wrinkles. 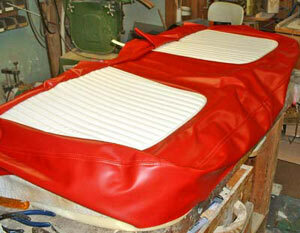 Many car seat panels were sewn with a canvas or heavy cloth hold-down incorporated into the seam. This hold-down creates a hollow channel into which a piece of wire (coat hangar wire is a handy thing to use if the original wire is rusted away) is run all the way around its perimeter. Note the channel of heavy cloth into which the wire will be run. The foam core of the seat will either have slits cut around the seating panel, through which you will be able to draw clips to pull it tight to the undersprings, or, as is the case with the T-Bird, the foam panel is separate from the bolstering panels. Either way, the panel is pulled down tightly by working from underneath the seat and grabbing the wire channel and pulling it up to the seat springs (or built-in wire holding strip) and then hog-clipping it to its mounting. Hog clips are used every few inches all the way around the perimeter until the panel is uniformly pulled tight and smooth. If the panel is bunched-up or wrinkled some of the clips must be cut off and the area redone. Tip: start in the center of each side and work toward the corners. Note the hog clips (copper color) holding the wire channel to the springs. Once the seating panels were in place, tight and smooth, it was time to stretch the remainder of the cover to create the bolstered effect. We'd like to say it's easy from this point but we can't. Due to the stiffness of the vinyl, curvature of the bolster corners and density of the foam, the stretching and finishing of the seat cover took a lot of effort and time, not to mention patience. We found the best way to get things stretched out (preliminarily, at least) without punching holes in the vinyl with hog clips was to use spring clips (or even those big paper clips) to hold the pulled-under seat cover edges while stretching over the foam. 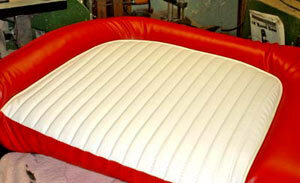 You can also see the edge shape of the foam underneath. Stretching the red portion involves pushing the edge of the foam down with your hand or a wooden spatula while pulling the vinyl up over the top edge of the frame. The vinyl is already clamped in place in the lower part of the frame in the photo. 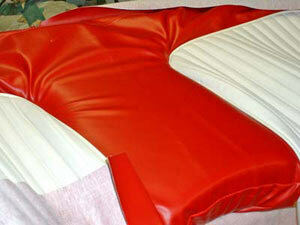 You can see where the white panel is pulled down onto the foam, creating the wrinkles on the red panel. This process is time-consuming and sometimes frustrating, but by clamping, stretching, pulling, re-clamping, etc., the bolstering eventually takes effect. The vinyl cover needs to constantly be pulled and clamped in steps, getting it ever tighter. We sometimes used a heat gun to make the vinyl more stretchy, but it's important not to get the material too hot — it burns. It's almost done now, just a few more wrinkles to stretch out. What you see in this article took over 10 hours to accomplish. About 2 hours were consumed in the removal of the old covering and cleaning/repairing/painting of the frame. It took another hour to install the tack strips. 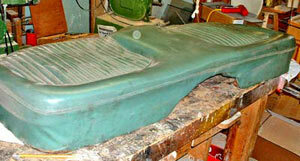 The remaining time was used in the actual upholstery process. You can see, therefore, that this is not a job for the impatient person. Of all the seats we've upholstered this was the most difficult one to do, and that includes the many vinyl and leather covers we've cut and sewn and the foam rubber we've shaped over the years. Considering the fact that the covers and foam were pre-manufactured and that the T-Bird has a bench seat, that's saying something! It was hard to do because of a number of factors; including the stiffness of the vinyl, density of foam, thickness of the seat and sharp curvature of the bolstered design. Nonetheless, we were able to end up with a finished seat that looks pretty close to original because we took our time (over several days) and didn't use hog clips until we were sure the vinyl had been pulled and fitted correctly. If things didn't look good we unclamped and loosened and repositioned the material until they did. It's assembled and wrapped in plastic for storage until installation..
Once the seat is in the car we'll steam out the remaining little wrinkles using a low-temperature iron over a towel. This will shrink the material just enough, but that's a few months into the future.